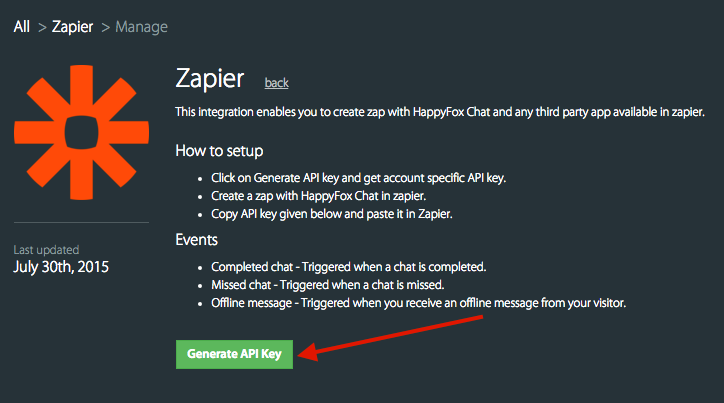 By enabling HappyFox Chat-Zapier Integration, when there is a chat related event you can create an action. For example when there is a missed chat (a trigger) on HappyFox Chat you can send an email alert (an action). 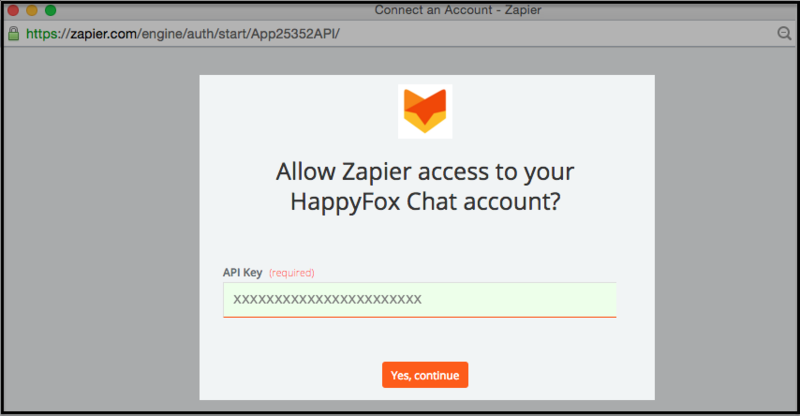 Only Admin has the access to integrate Zapier with HappyFox Chat account. This integration is available in Mighty and above plans. 1. Login to HappyFox Chat account. 2. Go to Apps → Zapier → Click TRY FOR 7 DAYS/INSTALL button. 3. Now click Generate API Key button and copy the API Key. Let's create a Zap for the following scenario. When there are new missed chats (which is the trigger) on HappyFox Chat, send an email to your gmail id (the action). 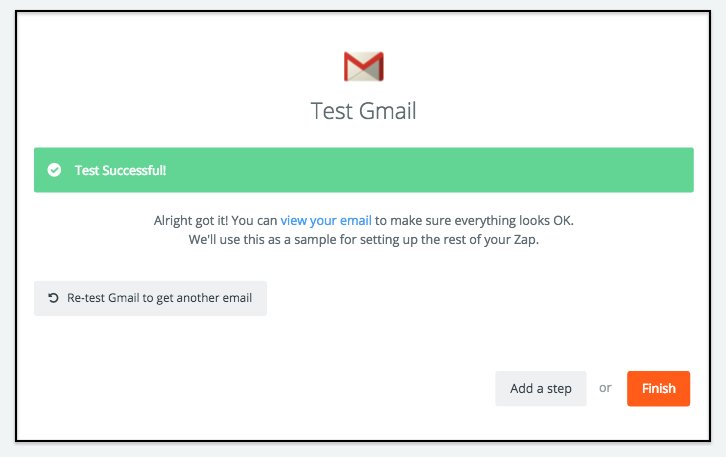 STEP 2: Click on Make a New Zap button. Under Choose a trigger app, Type HappyFox Chat and select it. It will take you to the next step. Choose New Missed chat as trigger → Click Continue. Hit Connect a New Account button. You will be prompted to enter API key of your HappyFox Chat account. After connecting to your HappyFox Chat account, click Save + Continue button. Now test this HappyFox Chat account by fetching sample chats. Click Connect & Continue. Now, create dummy missed chat on your HappyFox Chat account. Once the system fetches the test sample, you will see "Test Successful!" message as shown below. Click Continue. Choose action app → Type "Gmail" and select it. Under Select Gmail account → click Connect to new account button. 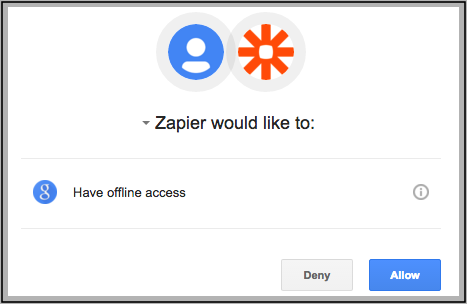 In this step, Zapier will prompt you to grant access to your Gmail account → Click Allow button. Under select Gmail action, select Send Email → Click Save + Continue button. You can send a sample message to preview the email for missed chat. On testing successfully testing the sample message, you can see the below screen. Click "Finish" button. Step 6: After testing and naming the Zap, turn ON the Zap. Your Zap will be created successfully! You can set “custom filter” so that you can set the action only when there is a keyword mentioned in the chat. Example: upgrade plan / pricing / something relevant to your domain. Now, you can create more 25 Zaps in a simpler method. Check out Zapier's app page.